While contemplating what I would share with you for Friday Foodie, I was a little stumped. Nothing I prepared this week was anything special and certainly nothing was worthy of pulling out my camera. So, what to do? Aha! One of my favorite picnic sandwiches would fit the bill; after all it is summer and summer is all about picnicking with family and friends. So my blogging friends I give you my favorite recipe for Pan Bagna. This recipe came to me about twenty years ago in one of my favorite cookbooks Bistro Cooking by Patricia Wells. I've also been invited to post this recipe for Simple Supper Saturday on Martha's blog The Krazy Kitchen. Thanks Martha, you're right, this would make a great meal on a hot summer day! Pan Bagna—literally bathed bread—is like a salade Nicoise on a bun. The author writes, "Whatever the combination, the sandwich should be moist and sort of messy to eat: There's nothing worse than a dry pan bagna!" Slice the bread or rolls in half lengthwise. Combine the garlic and oil and, using a pastry brush, brush both the bottom and top portions, pressing firmly in the bread. Drain the anchovies and soak them in water to cover for several minutes. Drain again and pat dry. Cover the sandwich with the top portion of bread. If using a baguette, cut the sandwich into four equal portions. Press down firmly on the bread. Do not be concerned if the crust cracks. Cover tightly and securely with plastic wrap, then weight the sandwiches down to flatten them even more. Refrigerate with the weights (I press them between two heavy cutting boards) for several hours or overnight. Serve slightly chilled. Voila! A wonderful sandwich, perfect for a picnic at the beach! I make these whenever I have visitors and they are always a hit. I know a lot of people don't care for anchovies, so I just don't tell them they are on the sandwich and they never notice. I love adding thinly sliced cucumbers, olives, romaine leaves and sliced hard-boiled eggs on mine. I didn't have a photo to share with you, so I googled and found the one pictured above from Martha Stewart. She slices hers smaller than I do, but her ingredients are almost the same as the recipe I use. Of course, being Martha, she poaches fresh tuna in oil for her version. You can find Martha's recipe here. On Mondays I post vintage beach pictures and this last Monday one of those included was a sketch from an original Augustus George Heaton painting titled, The Bathing Hour: Trouville (Salon of 1880). 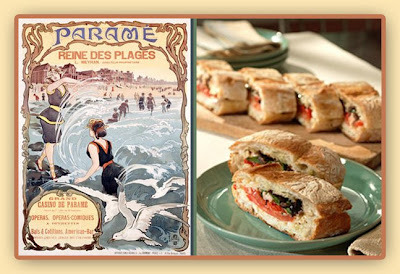 In keeping with my French theme, I found the delightful poster Parame French, Beach Casino pictured above; it can be purchased here. Bon appetit, now go visit Michael at Designs by Gollum for more of today's Foodie Friday posts. Au revoir for now! NOTE: For those participating in my seashell identification giveaway on Sundays, I have an announcement. The competition is close and nearing an end, so instead of randomly posting, for the next three weeks I will be hitting "publish" at exactly 2:00 pm EST. Good luck! Looks good for a fancy picnic. I tried making Soft Shell Crabs while this week. I hope you'll share this on my recipe exchange. Here's my link for Friday's Feast. Morning, Rhonda! Oh, this sounds good! I'll have to try it! Rhonda, you can put anchovies on anything, even cardboard, and I would love it! Sounds delicious. I just cannot believe that your ancestors lived on Pace's Paines! Isn't that something? This looks fabulous! Ummm... I need to remember this one. I absolutely love this. Thank you so much for the recipe and your great explanation of how the sandwiches are assembled. And good to eat at the BEACH! I feel the same way about it as you do, but I am on L.I. so we get cold weather for winter. But I still walk down and visit the water. My dh asks if I am checking to see if it is still there! Oh yum, that sounds and looks amazing. Thanks for sharing, and thank you for the sweet comments!! Looks delicious. I will certainly try. Hubby is going to LOVE that I found your blog. This recipe was made for him. BTW I love the Tiki Hut Rules, great attitude. This looks yummy! I've never tried this kind of sandwich.